It had been years since I talked with Eric Sternlicht, Ph.D., so it was great to receive an e-mail message from him last spring. I met Eric about 25 years ago. 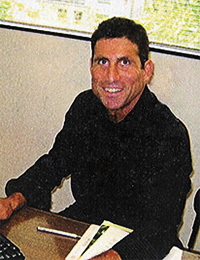 He was a solid body builder and was finishing up his doctorate in exercise physiology at UCLA. In the Early '90s we tried to team up on a bodybuilding book, but things didn't work out. I was teaching at Cal State, Los Angeles, at the time; Eric was at UCLA. Eventually, he moved over to Occidental College in Eagle Rock, California, Which, ironically, is only about a 15-minute drive from a school I've been teaching at since 1999, Pasadena City College. We finally hooked up again at the end of August. I drove over to Oxy, where Dr. Sternlicht is the director of the Human Performance Lab. He also still runs his highly regarded consulting company, Simply Fit, and is deeply involved in research projects and work as a trial expert. He's 50 now but looks 35. Oh, that head of hair! 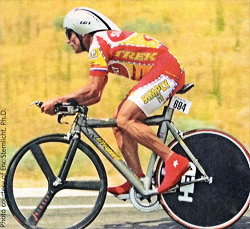 I did know that Eric had traded in the weights for a bike years ago - he won the United States Cycling Federation Masters National Time Trial Championships in 2001 and '05. 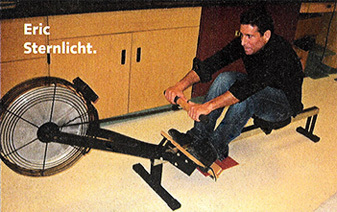 In fact, I made him prove he's still in top condition by asking him to give me a minute or so the Concept2rower in the lab. I asked him what projects were in the works, and he reeled off serveral: "The latest have involved looking at exercise programs and blood lipid modifications for health benefits, meal-replacement shakes for various metabolic improvements, muscle activity during different workouts and activities." "My latest proposal is one developing a diet and activity program to treat and precent type 2 diabetes. We're still waiting to see if we can get funding on the project, but it looks very positive." Eric, who has penned many articles for IRON MAN since John Balik and Michael Neveux bought the mag in 1986, lives in Orange County with his lovely wife, Chrissy, and daughter Elena, 10. Eric and IM science writer Jerry Brainum are two of the sharpest people in the field I've ever encountered.